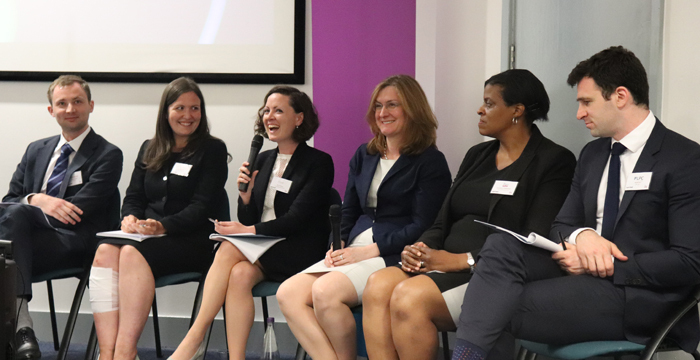 Left to right: Hardwicke’s Cameron Stocks, Cornerstone’s Tara O’Leary, Radcliffe’s Lauren Kreamer, Serjeants’ Inn’s Fiona Paterson, ULaw’s Jacqueline Cheltenham and LPC Law’s David Earl. Gathering in The University of Law’s (ULaw) Bloomsbury campus for Legal Cheek’s ‘How to make it as a barrister’ event earlier this month were: Tara O’Leary, a junior barrister at Cornerstone Barristers, Cameron Stocks, a junior barrister at Hardwicke, Lauren Kreamer, a junior barrister at Radcliffe Chambers, Fiona Paterson, head of pupillage at Serjeants’ Inn Chambers, David Earl, a county court advocate at LPC Law and Jacqueline Cheltenham, national Bar Professional Training Course (BPTC) programme and student affairs director at ULaw. This is what they had to say about the profession and how to succeed in it. It’s no doubt that the bar is a place for the academically gifted. In 2015, Legal Cheek revealed that a whopping 77% of rookie barristers at the top 30 chambers had studied at Oxford or Cambridge. With the top end of the junior bar dominated by Oxbridge grads, it’s understandable students from other universities may feel they barely get a look in. So what other than a stellar academic record can help aspiring barristers get their foot in the door of a top set? Earl, who is due to commence pupillage with a leading crime and common law chambers, has already conducted over 500 county court hearings in just ten months at LPC Law. He thinks drawing on this practical advocacy experience took his application to the next level because he could show he’d “handled a real client on a real case in a real court for real money” — multiple times. It’s important to build connections and find unique ways to stand out, thinks Stocks, who accepts he had a rather unusual connection with his chambers. His first interaction with a Hardwicke barrister came when he was studying at Durham and selling luggage part-time. One of his customers was a barrister, who had studied at the same university college as him and, whilst on mini-pupillage with her, he discovered that another member’s daughter had taught him at sixth form. “It was a great talking point for my interview and made my application to chambers so much more personal,” he reflects. The process of making it as a barrister can be tough with successful candidates often writing tens — and sometimes even hundreds — of applications before securing a place in chambers. While most chambers accept applications through the centralised Pupillage Gateway, some still ask candidates to submit a CV and cover letter. Keep your cover letter focused and traditional, advises Cheltenham, who remembers one student who crafted theirs in the style of a brief — something which Paterson advises applicants steer clear of. Some interview questions are designed to test candidates’ ability to think on their feet and deal with the unexpected — something they’ll no doubt face in court. But this shouldn’t startle students, says Stocks, who thinks it’s a chance to pause and step away from scripted answers. When you first start advising clients, Kreamer says you don’t have to match the “shining example” of an experienced barrister. “You have to act in accordance with your duty to your client and to the court, but you’re not a QC and so your client isn’t expecting silk-level expertise. If they wanted a QC, they would’ve paid for one,” she reminds the audience of over 70 students. O’Leary remembers one occasion when she returned instructions to the clerks with a recommendation that the work would benefit from the expertise of a more senior barrister. Pupillage is a 12-month training period divided into two distinct six-month periods. Most pupils will get the opportunity to observe several different areas of law in practice, and Stocks advises aspiring barristers approach this with an open mind. “If someone had told me during my degree that I would end up practising property and private client, I would have laughed at them but I love my areas of practice,” he says. What’s life like as a barrister? Some of the panel shared stories about (the much talked about) work-life balance at the bar. “I know a silk whose wife is the gatekeeper of her phone when they’re on holiday and unless it’s urgent, you won’t get through to her”, shares Stocks, and Cheltenham knew a barrister who had her first child and was back in court three weeks later. The balance depends on your area of practice and seniority, says Paterson, who specialises in difficult medical and welfare cases. She once received last-minute instructions for an emergency hearing while out for dinner on a Saturday night. “It’s not a nine-to-five job,” she warns.